Let me start off this discussion by framing it with my acknowledgement of Maurice Casey as a genuine scholar, someone who I respect for his deep engagement with the Bible. Though he is not a believer, he takes the Bible quite seriously. From what little I’ve read of his book so far (I plan to read much more of his work with Aramaic), I appreciate the questions that he makes me ask and the hard facts that he brings to my attention. 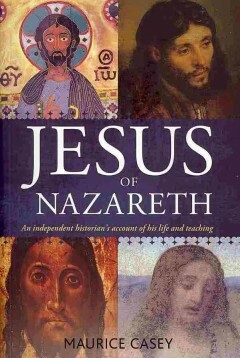 I’m currently enjoying his book Jesus of Nazareth: An Independent Historian’s Account of His Life and Teaching, but there’s something there I must address. To all 3 of my readers. I treasure each one of you. Apparently holding this sort of “unscholarly polemic” in low regard, Casey then ironically returns the favor. He spends approximately 1 whole page of his book denigrating one scholar–and even the institutions at which he has held teaching positions. According to Casey, not only is this scholar wrong, but both he and his schools don’t even produce actual scholarship. Casey proceeds from stretching this one comment to make it a remark, no a “rejection,” of critical scholarship in general to pointing out that Witherington has a PhD that “qualified him to teach at an independent university,” but wrote these comments while teaching at Ashland Theological Seminary (22). Aside from the implied jibe at Witherington’s choice of institution, Casey goes on to cite the “Core Values” of Ashland, which includes holding the Bible as an infallible revelation from God. He adds that in 1995 Witherington was appointed “Amos Professor of New Testament for Doctoral Studies” at Asbury Theological Seminary. Actually, Witherington was only hired at Asbury as a full professor in 1995; the Jean R. Amos Chair wasn’t created until Asbury unveiled its Ph.D. in biblical studies only a few years ago. Here’s where I make my own bias known if it isn’t already. I had three classes with Ben Witherington at my time at Asbury Theological Seminary enroute to an M.A. in biblical studies, which I finished in December 2011. Critiquing Witherington’s comments on Jesus scholarship in a published book is certainly fair game, especially in a scholarly book on Jesus, but ridiculing a seminary faculty’s academic gowns as a hollow sign of its supposed scholarly inauthenticity is a whole other matter. Simply because they teach at a confessional theological seminary with official statements on what they collectively believe about the theological nature of the Bible, does not in the slightest degree diminish the scholarly qualifications and contributions of a faculty who have completed Ph.D.’s at respected institutions and further our knowledge of the biblical texts. So, Casey continues, Witherington (don’t forget this book is actually supposed to be about Jesus) has demonstrated that he does not understand “independent” British universities (though he got his Ph.D. from one) and that Witherington “does not always tell the truth”! So he’s ignorant about something he should know something about, and to top it off, he’s a liar. So concludes the first quest for the historical Ben Witherington. And it is totally out of place. If Casey had a bone to pick against Witherington and wanted to pick it in a published format he should do like I’m doing — get a blog and rant. It’s a shame that he’s made a big book about Jesus that’s already big enough even bigger by a discussion that adds nothing to his “independent” account of Jesus’ life and teaching. After all, I paid for these pages. Indeed, it’s always the easiest route to discount a scholar’s points through argumentum ad hominem and discount the scholar’s very status as a scholar, but it is much more relevant to actually argue the points themselves. So anyway, I guess I’m playing the same game Casey plays in regards to the Sheffield debate, by defending the one I hold in high regard. But I don’t make any apologies for doing so on my personal blog that people can view for free. For what it’s worth, Witherington mentioned Casey several times in my classes and had only positive things to say about his work. One last serious critique of Casey and hopefully I won’t have another throughout the rest of the book. Casey’s usages of the word “independent” that I have quoted so far have had scare quotes around them because of the ridiculous way in which he uses it. Not only does it feature prominently in his book’s subtitle (An Independent Historian’s Account …) but he repeatedly asserts throughout the book that what this means is that he is not of a religious persuasion. Therefore he is “independent” and the implication is that his portrait of Jesus is all the more reliable because he is objective. Well hopefully he is aware of the fact that we’re all biased and no one is objective. To not be a Jew or a Christian (especially within the realm of Jesus studies) is to have a religious position and does not in any way make you “independent” or objective. Not to mention that Casey is himself a former Christian, having left the faith in the 1960’s as he admits (39). His praising of Crossley and Fisher as having “completely independent minds” as he does is strangely cult-like. That being said, I really like Casey. It’s actually enjoyable to read academic material in which the author’s personality is reflected, and though he does have a chip on his shoulder, he is quite fair in his treatments and does actually come closer to what we may call objectivity than many other scholars do. Maybe that’s what’s so frustrating about this “independent mind” talk. We have a scholar here who if he just does his job people will see that he is rather even-handed with his treatment of the work of Christian, Jewish, and atheist/agnostic scholars, and that he really is on a quest for historical truth. And one that has a sharp mind and massive learning to help him on the way. Why he feels the need to defend himself, or worse, sectarianize himself with those who think similarly to him I am not sure. ← The diversity of images of Jesus in the New Testament . . . I, too, can vouche for Witherington not speaking using pejorative terms viz-a-viz Casey, not in class and not in his commentaries. If one were to scan the footnotes of Witherington’s Mark commentary, then one would see that Casey’s name appears FREQUENTLY and in general agreement. Surely, Casey’s agenda with ‘independent scholarship’ is fundamentally grounded in steering clear from religious affiliation; it is interesting, however, that he is willing to berate Witherington but not Wright.